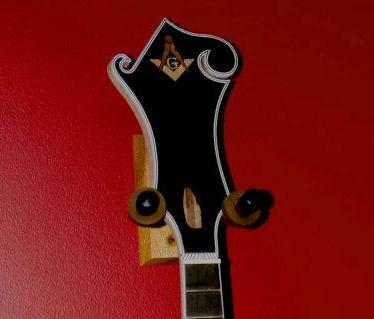 Inlay with addition of "G"
Joe Hardwick’s inlay test piece made it onto the headstock in good order, with the square in maple, the compasses in sapele, and the hinge in walnut. The square and compasses looked perfect, and I figured that the G wouldn’t be necessary. After all, the English Masonic symbol lacked the G, and it looked pretty good. But Joe’s a perfectionist, and one evening, after working in his shop for a couple of hours with a jewelers saw and a piece of maple, he walked into his living room and handed his wife Lita a perfect, delicate G. “You did it!” she said. Joe didn’t say much, but he was pleased. So was I. 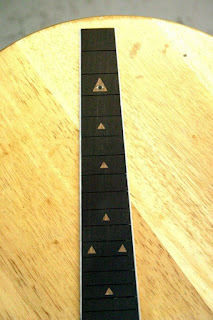 Our next conversation concerned the fretboard markers, which are used to indicate which fret is which, and can be more or less decorative depending on taste. The classic dots didn’t seem appropriate for a Masonically-themed instrument, and we hate both the plain block and the fancy curls popular among some players. We talked about offset squares, but Joe wasn’t satisfied with what seemed to both of us an easy but incomplete out.. A few days later, he called me and said he’d posted a couple of pictures on Facebook. I thought he was through surprising me. I was wrong. 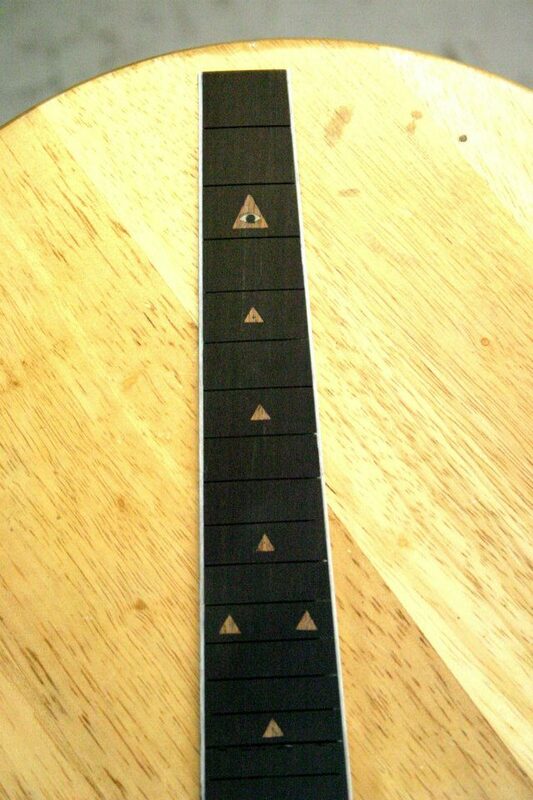 The markers were triangles in sapele, but the top one was the all-seeing eye, with the pupil made out of ebony. I knew he was an artisan. I realized at that moment that he was also an artist. That knowledge would be confirmed in the days to come. This is the fifth installment of Michael Shirley's Mandolin Series.